The cost of Sheffield’s tram-train pilot project has quadrupled and the benefits remain uncertain, a new report has highlighted. A report published by the UK’s National Audit Office (NAO) into the Sheffield to Rotherham tram-train project showed that the cost of the infrastructure scheme has risen from the £18.7 million budget set when the pilot was approved in May 2012 to £75.1 million. The project schedule has also slipped. Network Rail had hoped to complete the work in December 2015 but it announced in December last year that the complexity of the project meant that would be pushed back to May 2018. The NAO’s investigation described how in November 2014 – when the project cost rose to £44.9 million – the then Permanent Secretary, Philip Rutnam, decided against cancelling the project, believing it would cause reputational damage, and the Department for Transport (DfT) offered additional funding. In July 2016, with costs continuing to rise, the Permanent Secretary backed a recommendation from the Department for Transport’s Rail Investment Board for the project to be scrapped. This recommendation wasn’t supported by Rail Minister Paul Maynard and Network Rail agreed to make up the funding shortfall by re-allocating money from its renewals and enhancements budgets. The tram-train pilot, which was backed to test the viability of tram-trains in the UK, includes both the construction of new infrastructure and the modernisation of existing routes. A new rail link between the Sheffield Supertram network and the national rail network has been built – called Tinsley Chord – to allow the tram-trains to travel directly from Sheffield to Rotherham town centre. Other works include electrifying the line between Meadowhall South and Rotherham Central station and Rotherham Parkgate, extending the platforms at Rotherham Central and replacing rails on the Supertram network. The South Yorkshire Passenger Transport Executive (SYPTE) has also procured seven new Spanish-built Class 399 tram-train vehicles. Having detailed the project’s financial history, the report went on to say it was too early to gauge whether the project would achieve the strategic benefits it set out to. “The Department and Network Rail have learned lessons from the pilot but it is too early to determine whether the project will realise the wider strategic benefits,” the report said. “The Department and Network Rail have begun to capture the operational issues involved in using tram-trains in the UK and have, for example, established new technical standards for the signalling. 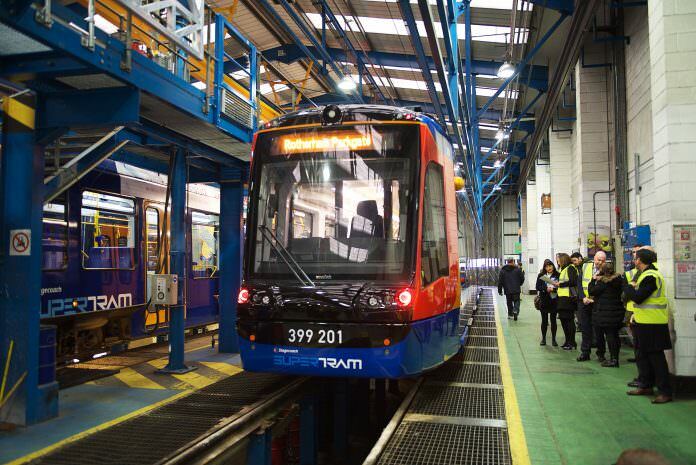 Network Rail has shared lessons learned with other tram-train promoters. The report said Network Rail “did not have a full understanding of the costs” at the start of the project, revising the figures as it identified technical challenges. In response to the report, Network Rail issued a statement explaining some of the difficulties it has faced on the project before going on to say that good progress was now being made. One challenge has been the difference between the DC power supply on the Supertram network and the 25 kV AC system used on the national network. In July 2012, electrification of the Midland Mainline up to Sheffield was deferred until after 2019 and Network Rail said it had taken time to “future-proof” the tram-train electrification for any future conversion, which hadn’t been part of the original scope.